Chikungunya is a viral disease that is transmitted from the bite of an infected mosquito. To date, two specific species have been identified, which include Aedes aegypti and Aedes albopictus. Chikungunya is classified as an alpha virus with positive single-stranded RNA genome. The disease was first described by M. Robinson and W.H.R. Lumsden following an outbreak that occurred in Tanzania in 1952. Since that time, outbreaks have continued to occur in Africa, Europe, parts of Asia, and more recently in the Caribbean. The Pan American Health Organization has reported over 900,000 suspected cases in 40 countries over the last 11 months. From a clinical perspective, Chikungunya has an incubation period of two to twelve days, with the majority of cases occurring between 3 and 7 days after being bitten by an infected mosquito. A fever of 102 degrees (F) and joint pain are the characteristic symptoms. Rash, fatigue, joint stiffness, headache, and nausea/vomiting may also occur. While a majority of patients do feel significantly better within a week of onset, joint pain (arthralgia) may persist for several years following infection. Schilte C. et al (2013) followed 180 patients in 2006 from an outbreak on La Reunion Island and concluded that over 60% continued to experience symptoms of arthralgia 3 years after infection. Young children, elderly adults, pregnant women, and those with pre-existing disease are at greatest risk. The disease has caused mortality in a relatively small number of cases so far. The disease has been reported in the US since 2006, stemming from travellers who had been to countries where the virus is common. The disease has spread rapidly throughout the Caribbean and parts of Central America. In late June 2014, the first two locally acquired cases were identified in south Florida. Neither infected patient had travelled outside of the U.S. The virus is not airborne or able to be transmitted from person to person. Mosquitos are the primary vector and transmit the disease by biting a healthy person. Following infection, immunity is incurred as protective antibodies have been developed. Unfortunately, the spread of the disease can occur rapidly as it is a new virus to the continental U.S. leaving most of the population susceptible. To date, 11 locally acquired cases have been reported in Florida. Counties affected include Miami-Dade, Broward, Palm Beach, and St. Lucie (http://www.cdc.gov/chikungunya). Primary diagnosis is made based off of clinical symptoms, travel history, place of residence, and exposures. Confirmation of disease by laboratory testing through serum or plasma can occur with detection of virus, viral RNA or viral antibodies. The CDC and some state health departments perform viral testing. At present, there are no vaccines or specific anti-viral treatments for Chikungunya infection. Treatment focuses around supportive care including rest, hydration therapy, and non-steroidal anti-inflammatories (NSAIDs) to relieve pain and fever. There is concern that Chikungunya could affect more than 10,000 people in Florida alone. This projection, from the Florida Medical Entomology Laboratory, is based off statistics from other outbreaks. As a physician who has devoted significant time to traveling the world recently on a volunteer mission to help people with hearing impairments, I have a new sense of the significance of World Health Day, which was celebrated Monday. I also have a new sense of the limitations of the organization associated with this day: the World Health Organization. Since November, I have visited five developing countries as a volunteer physician with the Starkey Hearing Foundation, a pragmatic, results-based organization committed to fitting 1 million hearing-impaired people with hearing aids worldwide. My travels have taken me to the Philippines, Haiti, Senegal, Liberia and Mexico. Founded in 1984 by William and Tani Austin, the Starkey Hearing Foundation has given the gift of hearing, and changed lives, for more than 1 million children and adults over these past 30 years. I had the pleasure of being featured on Fox13, WTVT, last night. Kelly Ring put together a story about my recent travels with the Starkey Hearing Foundation for a segment called “What’s Right in Tampa Bay.” The Fox13 crew were a pleasure to work with, and the story explains what my work with the Starkey Hearing Foundation means for my mandate as a physician. You can watch the story on my media page: http://www.doctorrobertdean.com/media/, or at http://www.myfoxtampabay.com in their “What’s Right” tab: http://www.myfoxtampabay.com/category/235258/whats-right-with-tampa-bay. Tampa, FL (March 6, 2014) – Thousands of people across the world are hearing sounds for the first time, thanks to the Starkey Hearing Foundation. Robert Dean, MD, a Tampa, Florida-based physician and journalist, is personally responsible for fitting nearly one thousand people with their first hearing aids. Dr. Dean just returned from a trip to Mexico, where he continued his volunteer work for the Foundation. He began traveling with the Starkey Hearing Foundation in November of 2013, spending two weeks in The Philippines during the aftermath of Typhoon Haiyan. He followed that up with trips to Haiti, Senegal, and Liberia. In each location, the Starkey Hearing Foundation provided thousands of people with free hearing aids, making sure they fit each individual ear. Studies confirm that children born with hearing loss become isolated from society, and rarely develop the speech that is so essential for their social and intellectual growth. The Starkey Hearing Foundation is not just committed to helping people achieve that connection to society, but also sheds a light on how to reduce instances of preventable hearing loss. The Foundation shares research into which types of medicines can contribute to deafness, and encourages groups like the Gates Foundation to continue their work bringing vaccines to developing nations, in order to reduce cases of congenital hearing loss. The Starkey Hearing Foundation was founded in 1984 by William and Tani Austen. They recently made a commitment to the Clinton Global Initiative to distribute one million hearing aids over the next ten years. Dr. Dean, a physician with a long record of exploring the natural origins of medicine, will share commentaries and videos from his travels in advance of World Health Day. He blogs about his journeys at www.doctorrobertdean.com. You can also follow him online at www.twitter.com/drrobertdean or www.facebook.com/drrobertdean. It seems I’ve caught a serious case of the travel bug since my very meaningful and emotional trip to the Philippines in late 2013. 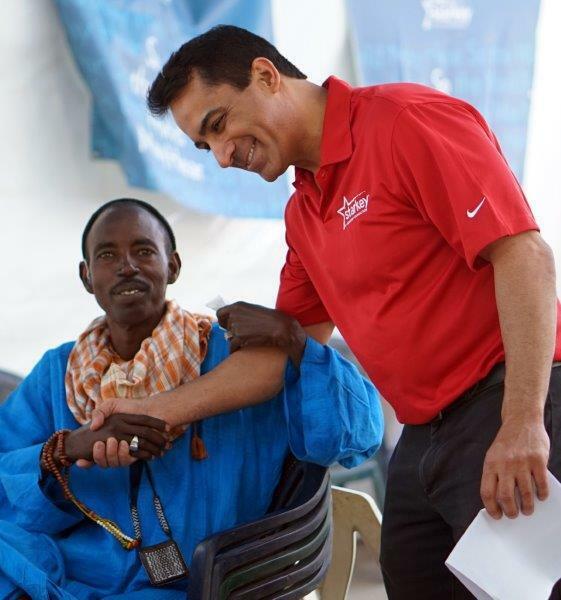 It turns out that journey with the Starkey Hearing Foundation (SHF) was just the beginning of an intense period of global travel. My November/December trip to The Philippines was part of a humanitarian mission whose timing came shortly after Typhoon Haiyan struck. Our goal was to fit as many hearing-impaired children with free hearing-aids as possible. I’m proud to say there are now 5,000+ children who have regained hearing, thanks to the work of the Starkey team. But our mission didn’t end there. My next stop was a trip to Haiti in January. Even four years after the tremors that took more than 100,000 lives, residents are still dealing with the after-effects of that devastating earthquake. The tent cities still stand, though just a fraction of the tens of thousands erected after the disaster. But life in Haiti is a struggle to survive — for some it is nearly impossible. 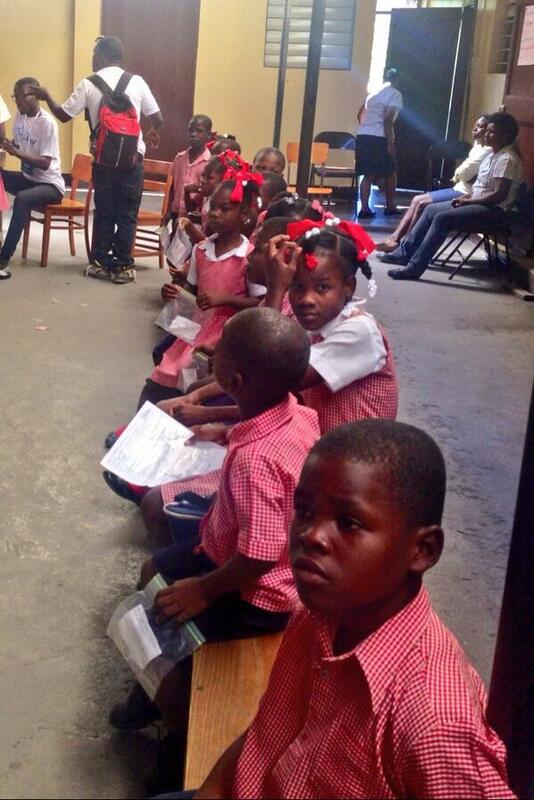 SHF teamed up with local partners, including Hope 2 Haiti and International Village, to bring the gift of hearing. We learned that people with disabilities are often labeled as worthless in that culture… so the blind, deaf, or handicapped were simply tossed aside and left to die. For the members our team, we felt we were bringing more than hearing aids into this community… we were also bringing acceptance. There are many preventable causes of hearing loss in the developing world – it is a topic I will tackle in a future blog. But what I have found so awe-inspiring is that the Starkey global health initiative is not at all theoretical; it focuses on practical action to have an immediate impact on lives, one person at a time. Other organizations can learn from their pragmatic approach – which includes training residents to maintain an aftercare program for years to come. SHF also works to identify preventable medical causes of hearing loss, in the hope that someday, hearing aids will no longer be necessary. I’ll post soon on my recent trip with SHF to West Africa – and then a February trip to Mexico. As I said, I’ve been struck by a new desire to travel with a purpose. Although jet lag is a force to be reckoned with, the desire to be of service burns ever brighter.